Dial 1119 is an exceedingly well-made B-movie. It’s suspenseful, well-acted, and holds up extremely well. 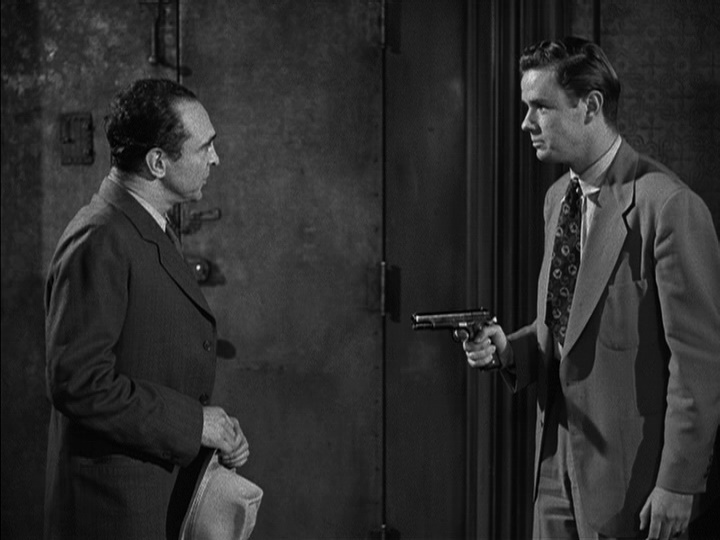 You don’t have to be a fan of film noirs or “old movies” to enjoy this one. As long as you can tolerate watching movies shot in black & white, Dial 1119 will keep you on the edge of your seat for its brief running time of 1 hour and 15 minutes. Wyckoff is a convicted murderer who has escaped from a hospital for the criminally insane. Dr. Faron’s testimony kept Wyckoff from going to the electric chair, but the young man is clearly deeply disturbed. He is obsessed with war, death, and murder, and is a deadly threat to anyone who crosses his path. After stealing a pistol and killing a bus driver, Wyckoff goes in search of Dr. Faron. When he finds his office closed for the night, he crosses the street to the Oasis Bar, where he holes up and takes hostages. It’s surprising how current many aspects of Dial 1119 feel — like hostages watching their own predicament on TV. All the chime-in Charlies blathering into a reporter’s microphone about what they’d do if they were in the same situation will feel eerily familiar to anyone who’s read comments on an article on the internet. Also, if you’re used to television sets in movies from the 1950s with screens that are the size of a postage stamp, brace yourself for the biggest TV screen you will see in a movie from 1950. The bartender at the Oasis, Chuckles (William Conrad), has a TV that’s so large and flat that it almost looks like a modern hi-def set. He mentions at one point in the film that he paid $1,400 for the television set, and then complains that for all the money he paid it still only shows crummy westerns and professional wrestling. Replace “westerns” with “reality shows” and this movie could take place in 2016. One of the things I especially loved about Dial 1119 was how much of the story is told without dialogue or music. 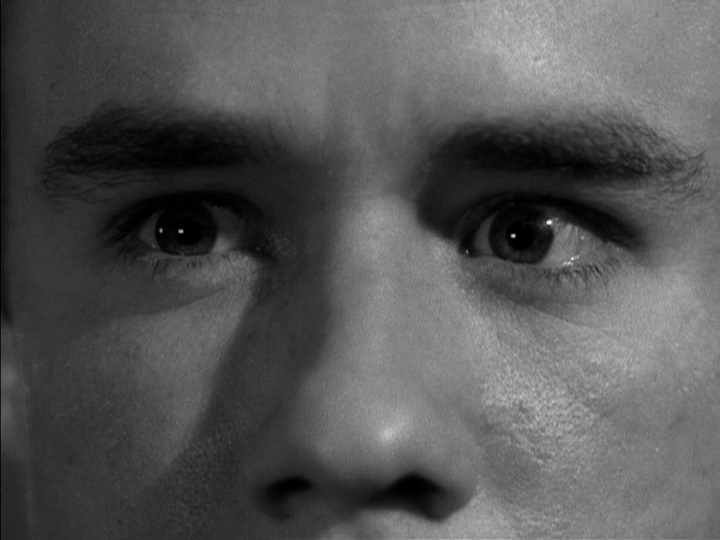 We watch the actors’ nervous eyes and sweating faces, and we know exactly what they’re thinking. The score by André Previn is great, but it’s used very sparingly, and never tells the audience how to feel. The actors’ performances and Gerald Mayer’s deft direction tell us everything we need to know. 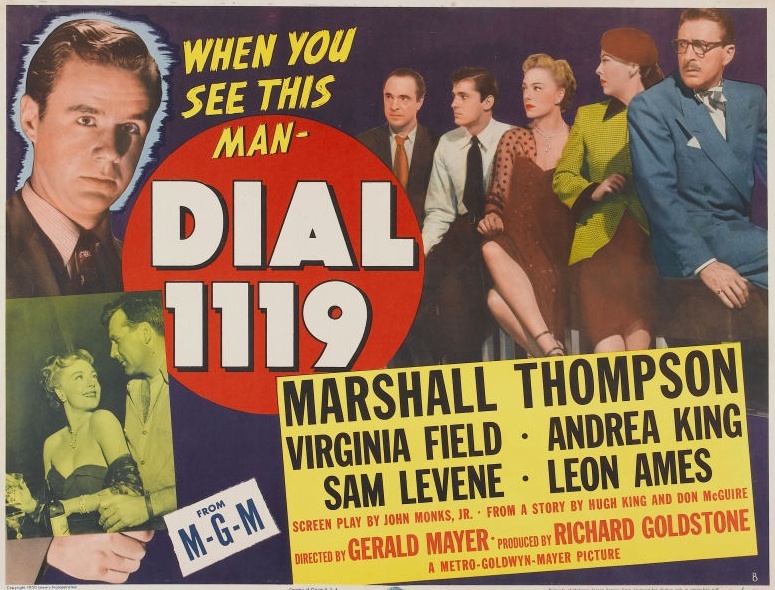 Dial 1119 has a low budget and was obviously shot as a second feature, but M-G-M productions were always glossy, nicely lensed affairs, even when they were “B” flicks. Posted in 1950, November 1950 and tagged André Previn, Andrea King, Film Noir, Gerald Mayer, Leon Ames, Marshall Thompson, Metro-Goldwyn-Mayer, Sam Levene, Virginia Field, William Conrad. Bookmark the permalink. “Mystery Street” is too generic a title for this groundbreaking crime thriller. 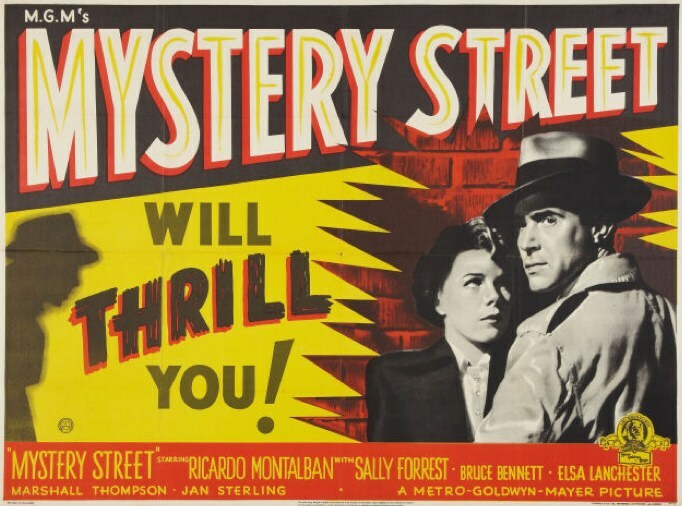 To me, Mystery Street sounds like one of those mystery programmers from the ’30s and ’40s designed to run as a second feature — perhaps featuring Charlie Chan or The Crime Doctor. But with its focus on forensic investigation, Mystery Street is an innovative police procedural. Only its title is run-of-the-mill. If you’re a fan of TV shows like CSI: Crime Scene Investigation and Bones, make some time to watch this movie, and see where the genre got its start. In the post-war years, “reality” entertainment was king. 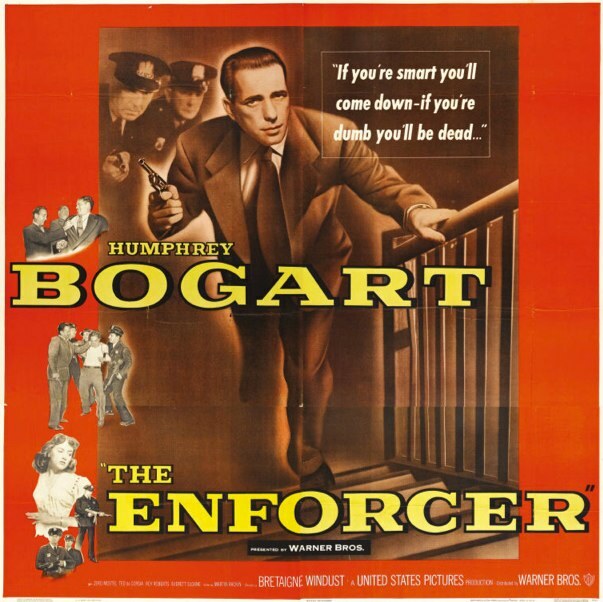 The “ripped-from-the-headlines” police procedurals that are still all over TV kicked off with the film He Walked by Night (1948) and the radio show Dragnet, which began broadcasting in 1949 and quickly inspired a slew of imitators. 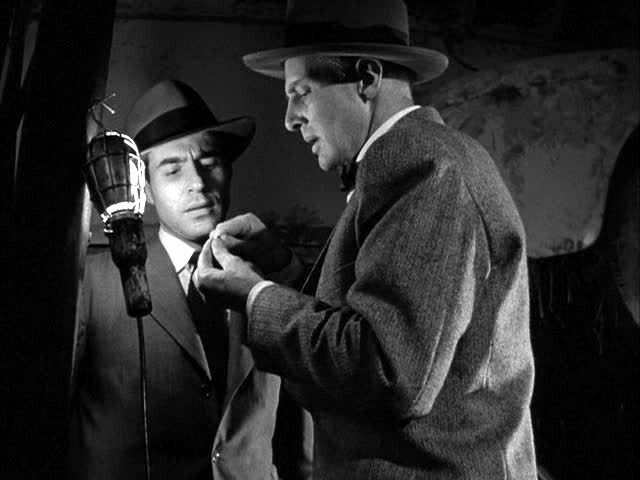 Mystery Street is a stylish and very entertaining noir. It was nominated for an Academy Award for Best Story. 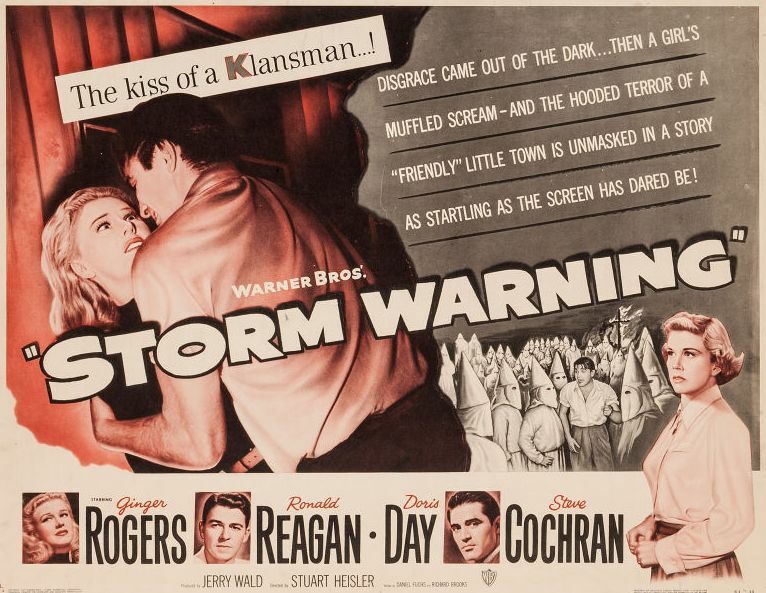 I think it would make a great double bill with Border Incident (1949), another film that starred Ricardo Montalban when he was first establishing himself in Hollywood. He’s a compelling and charismatic leading man, and it’s fun to watch him before he was a household name. 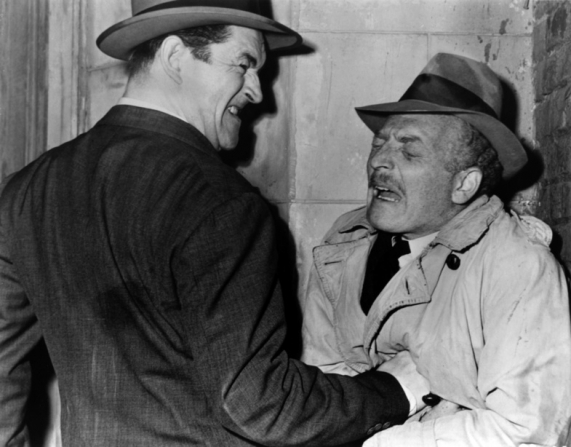 According to Wikipedia, Mystery Street lost money at the box office, which is a shame, because it’s a great little flick. Maybe a better title would have helped? Posted in 1950, July 1950 and tagged Bruce Bennett, Elsa Lanchester, Film Noir, Jan Sterling, John Sturges, Marshall Thompson, Metro-Goldwyn-Mayer, Ricardo Montalban, Sally Forrest. Bookmark the permalink.